Owners and operators in the nation’s biggest data center market are braced for two storms this week — the Category 4 hurricane barreling their way and the deluge of expenses they’ll face if their sites prove more vulnerable than anticipated. Hurricane Florence is set to batter the Carolinas, Virginia and Maryland when it makes landfall later this week and while coastal homes and businesses will bear the brunt of the damage, many inland properties are also within the storm’s reach. If the proper precautions haven’t been taken, the region’s reputation among telecommunication and cloud storage companies could be permanently damaged. This is a lesson the New York market learned all too well after Hurricane Sandy. Thanks to the growth of cloud-based storage, data centers are among the fastest growing asset classes in the country, as well as one of the most lucrative. On a day-to-day basis, owners need only keep the lights — and air conditioning — on, as so-called retail tenants pay for kilowattage, not square feet. Cheap land, favorable tax codes and abundant, affordable electricity have turned Virginia into an oasis of data storage. Roughly 70 percent of the world’s Internet use flows through Ashburn, a city 30 miles northwest of Washington, D.C. and home to the largest cluster of data centers in the country. Regional server hubs have also cropped up around booming tech centers in Charlotte and Raleigh, N.C.
Data centers are also marketed for their resilience, their ability to remain up and running at all times. As weather patterns become less predictable, that assurance is becoming harder to make, especially with natural disasters sitting atop many landlords’ lists of concerns. Ashburn, Charlotte and Raleigh, for example, are all far from the Atlantic coast but well within range of Florence, according to forecasts from the National Hurricane Center. Metro New York was an early adopter of data centers. In the 1980s and 90s, the city’s financial giants led the charge by building their own facilities, which, due to technological limitations, had to be near Manhattan to keep up with the frenetic pace of Wall Street trading. In the 2000s, as leasing became the preferred storage model and improved technology allowed data centers to serve far-flung clients, New York and New Jersey seemed poised to play a leading role in the budding industry by building on their existing infrastructure. Then, in 2012, disaster struck. Hurricane Sandy swept through the northeast, destroying homes, flooding streets and knocking out electricity for days. Tanker trucks were unable to deliver diesel fuel for generators and several data centers reportedly lost power. Others had to rely on backup electricity for as long as a week before power was restored. Even a momentary loss of power can cost a data center operator more than a million dollars in lost rent, not to mention the untold damage to tenants. 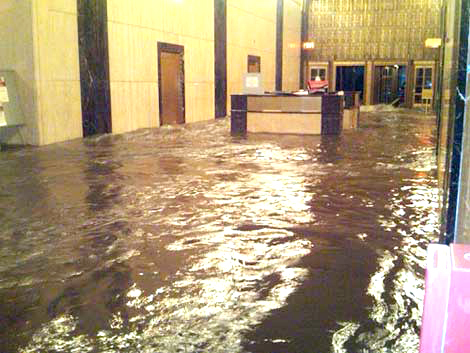 If Hurricane Sandy showed what could go wrong for a data center market, New York and New Jersey have also been an example of how to improve and fortify in an otherwise vulnerable environment. In the past six years, building hardening requirements have become more stringent and landlords have established better systems for delivering reserve fuel. Rechtin said, in an emergency, many centers are third in line for fuel after hospitals and essential government agencies. Also, some data centers managed to escape the 2012 storm relatively unscathed, including Sabey Data Centers’ 375 Pearl Street property, a 32-story partially-converted office building, which stayed active while the rest of Lower Manhattan was left powerless. John Sabey, the company’s CEO, said 375 Pearl had a strategic advantage by being vertically integrated —the lowest server floors at Intergate.Manhattan is on the sixth floor, 95 feet above sea level. number of centers in the area, many of which are occupied by Amazon Web Services, the largest cloud storage provider in the world. Other leading markets include Dallas-Ft. Worth, Phoenix, Austin-San Antonio and Chicago, places where land and utilities are relatively cheap and natural disasters are few. San Jose and Santa Clara in the San Francisco Bay Area are also industry leaders, despite the risk for earthquakes. These centers are primarily used by so-called “server huggers” in Silicon Valley. Similarly, most data centers in the New York-New Jersey area serve local companies that want their data close by, even if it means paying a premium. Financial services and the medical field alone make local New York one of the biggest hubs for local data storage in the country. In the first half of this year, the market absorbed 2.5 megawatts of new storage, according to a report from CBRE, with an additional 16.5 megawatts of capacity under construction. To put that in perspective, 177 megawatts were absorbed nationwide during that same time frame and 474 new megawatts are in the pipeline, mostly in Northern Virginia and Silicon Valley. Like the rest of the east coast, New York sends most of its cloud storage to Virginia. However, as new technologies, such as autonomous cars and smart buildings increase data creation, the demand for storage centers in all markets is poised to grow as well. Kyle Campbell is the online editor at Real Estate Weekly. He oversees REW Online, its social media channels and the Daily Briefing digital newsletter. He specializes in news-features on housing, technology, industrial real estate and various other market trends. His reporting has been published in the New York Daily News, Southampton Press and various newspapers in Michigan.